The market fragmentation of Australia’s booming dual-cab pick-up market continues, with the 2018 HSV Colorado SportsCat+ representing a high-end, road-focussed take on the broader workhorse genre. One of two HSV models, the Colorado SportsCat+ builds on the HSV SportsCat with more bling, stiffer suspension and more potent brakes, while the standard Colorado engine – a 2.8-litre four-cylinder turbo-diesel – remains untouched. 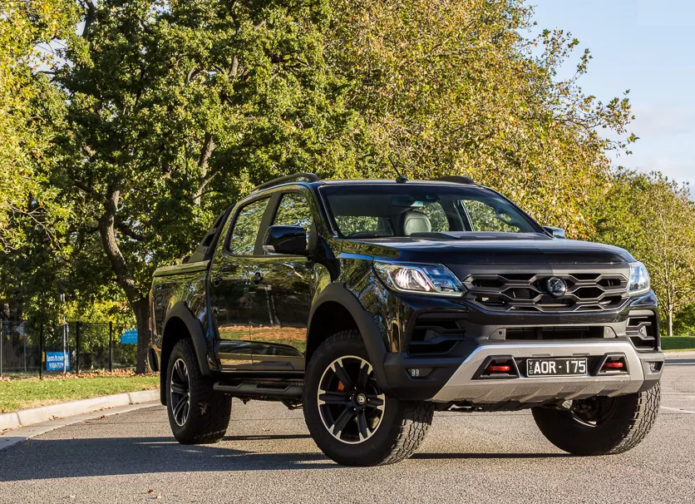 The HSV Colorado SportsCat retails from $60,790 (plus on-road costs) while the SportsCat+ starts from $66,790, with the option-laden SportsCat+ reviewed here priced at a heady $74,740. The 2018 HSV Colorado SportsCat+ makes a statement, that’s for sure, but is there a ready market for pick-ups where drive-away pricing is pushing the best part of $80,000? HSV certainly thinks so, and it has massaged Holden’s pick-up into one tough-looking package to prove the point. Dual-cab utes, or pick-ups as they’re perhaps more accurately known these days, are now firmly entrenched as ‘lifestyle’ machines: vehicles to shoulder a load through the working week and cart around the family and a variety of toys – caravans, camper trailers, boats, PWCs, dirt bikes etc. – come the weekend. It is a broad role to fill, especially when you throw off-road ability into the mix, but the continued uptake of dual-cabs by the Aussie buying public – the niche came second only to that of small cars in 2017 – means there will always be owners who seek to stand out in the crowd. At least that’s what HSV is hoping for, with its 2018 Colorado SportsCat and SportsCat+, which made their local debut late last year in Queensland. Actually, the model is officially termed as the ‘Colorado SportsCat by HSV’, underlining its arrival at an interesting time in HSV’s existence, where the loss of our local auto manufacturing industry essentially leaves the firm specialising in hot V8 sedans without a model range. The SportsCat builds on Holden’s volume-production Colorado with a restyled front end boasting LED fog lights and twin recovery points, along with a hard tonneau cover, a ‘Colorado’ applique across the tail gate, trick 18-inch rims, and an interior lift that includes leather-and-suede-appointed seating, red contrast stitching, a leather-wrapped steering wheel and leather and suede door and dash trim. Both models feature HSV sports suspension with stiffened front spring rates and the front ride height has been raised by 25mm, in turn increasing the vehicles’ approach angle to 32 degrees. HSV quotes ground clearance of 251mm for the SportsCat and SportsCat+, which is well over the 210mm of a standard Holden Colorado. The 2018 HSV Colorado SportsCat+ amps up the SportsCat package with a different front grille design, wheel arch flares, a ‘bonnet bulge’, different 18-inch rims and uprated front brakes with AP four-piston brake calipers. The SportsCat+ also scores a rear de-coupling anti-roll bar that HSV says improves “higher speed road driving performance” – it automatically deactivates once low range gearing has been selected. HSV’s SupaShock suspension, as first seen on the GTSR W1, is available as a $3600 factory option on the SportsCat+, taking the pick-up to another level of on-road control, while HSV has fine-tuned both models’ stability control systems to match the 18-inch rims and Cooper Zeon LTZ Pro all-terrain rubber, delivering what HSV describes as, “a more performance-based vehicle response”. Perhaps surprisingly, given the performance heritage of the HSV moniker, both the SportsCat and SportsCat+ feature the standard Colorado engine – the 2.8-litre four-cylinder turbo-diesel Duramax 2 – which is said to be good for maximum outputs of 147kW at 3600rpm and 500Nm at 2000rpm (440Nm with the manual transmission). The maximum towing limit remains pegged at 3500kg while both models have a payload limit of approximately one tonne. Both these models may feature a basic truck-style, ladder-frame chassis, but with a few extras the pricing quickly ramps up. The SportsCat starts from $60,790 in six-speed manual form plus on-roads, while the SportsCat+ sees this figure rise to $66,790. The SportsCat+ reviewed here, with six-speed auto ($2200), sail plane ($1300), SupaShock suspension ($3600), prestige Mineral Black paint ($550) and tub liner ($300), pushes that price to $74,740 plus on-roads – that’s $17,550 more than the auto version of Holden’s flagship pick-up, the Colorado Z71, and only a smidge below the imminent Ford Ranger Raptor. So is it worth the extra? It only take a glance to see this is no run-of-the-mill hay-hauler. There’s only so much designers can do with the basic pick-up body style, but the SportsCat+ certainly cuts a striking form and one which readily provokes double-takes from other motorists and passers-by. To our eye it would be a shame to hang a bull bar off the front of it, while that Colorado-emblazoned tailgate will leave no-one in any doubt as to its origins. With its increased ride height it’s a fair old step up to jump in but access is aided by A-pillar grab handles and side-steps. Once behind the wheel, the usual expanse of plastic inside the cab is softened nicely by the leather and suede accents and red contrast stitching, which extends across the dash to the door trim, and of course to the seating itself. On the subject, the driver and front passenger benefit from SV Sports seats, with superior seat foams and two-stage heating. The driver’s seat has four-way electric adjustment, while the front passenger makes do with manual adjustment. The steering wheel is adjustable for tilt but not reach. The seating is certainly comfortable and the side bolsters offer better support than standard Colorado seating, an important point given the SportsCats’ on-road performance. With its optional SupaShock suspension our SportsCat+ didn’t disappoint on the blacktop – in fact, this thing handles better on the road than any other pick-up we’ve sampled. It corners hard and flat, without any of the body roll normally associated with this style of vehicle, yet without being uncomfortable around town. It’s a high-quality suspension setup and it irons out road imperfection beautifully. It’s still firm at the rear, as you’d expect of a vehicle with workhorse credentials, but with superior damping that takes a significant degree of the harshness out of the equation. The stronger AP front brakes are also impressive, hauling the SportsCat+’s 2274kg tare mass down from speed with power and a relatedly high level of feel. It shouldn’t be this much fun to punt a pick-up through a set of bends, but that’s life aboard a SportsCat+ (or at least it is with one fitted with SupaShock suspension). The 2.8-litre engine is a dependable unit that pumps out reasonable grunt for decent blacktop progress. Highway overtakes are performed with alacrity but it does take a moment for the thing to wind up from a standing start. This can occasionally annoy but once the tacho hits 2000rpm the grunt feeds in strongly and continues through a meaty mid-range. The six-speed automatic has a manual sequential mode and it shifts cleanly and quickly enough, given the genre. It’s no sports car, obviously, but we have no complaints about the transmission’s cog-selection smarts and as we descended from the Dandenong Ranges to Melbourne’s east we appreciated the ‘grade braking assist’, which engages a high gear to complement manual braking with engine braking. We didn’t tow anything with the SportsCat+ but previous tests have amply proven the Colorado’s abilities in this respect. We’d be reticent to tow right at its 3500kg limit – as we would in any dual-cab pick-up of this ilk that claims such a figure – but it’s still a top option as a tow tug. It’s also reasonably quiet on the road – surprisingly so, given the mildly aggressive all-terrain rubber. In fact, there’s little in the way of road noise at all, with a bit of wind noise the most prominent factor at a steady highway speed, when the engine is pulling a lazy 1500rpm at 100km/h in sixth gear. The growl of the turbo-diesel makes its presence known when you bury your right foot, but in general the sound suppression is quite good for a pick-up. The electric power steering offers good feedback and requires only a light tough at the wheel. That’s a good thing, because the SportsCat and SportsCat+ come with a considerable 13.6m kerb-to-kerb turning circle. That’s nearly a metre more than a standard Colorado and it means extra care is required in tight environs like multi-storey car parks; thankfully these models comes equipped with front and rear parking sensors, plus a reversing camera which displays on the large 8.0-inch colour touchscreen, complete with predictive guides. As for off-road ability, with the optional SupaShock suspension the SportsCat+ presents something of a paradox. We didn’t take the SportsCat+ off-road but with its stiffer suspension and uprated front brakes it feels more at home on the bitumen than it would in the bush, despite what its increased ground clearance and those front recovery points might suggest. For those unfazed by taking 80 grand’s-worth of blinged-out pick-up into the mulga, this SportsCat+ (like the base-model SportsCat) has a dual-range transfer case, ala the garden-variety 4×4 Colorado. There’s a dial on the centre console that allows the driver to switch between two-wheel drive and four-wheel drive (high range), while four-wheel drive (low range) must be engaged from neutral at a standstill. There’s a hill descent control feature for steady, feet-off-the-pedals progress on technical decline, if desired. The SportsCat+ comes with a five-star ANCAP safety rating and has a fair suite of safety features – pick-ups have come a long way in this respect in recent years. Complementing the re-tuned stability control and anti-lock brake system settings is forward collision alert, lane departure warning and tyre pressure monitoring, along with more run-of-the-mill systems like rollover mitigation, trailer sway control and switchable traction control. The infotainment package is comprehensive and includes factory sat-nav, Bluetooth streaming, and Apple CarPlay/Android Auto compatibility. There is also a seven-speaker audio system that delivers crisp, quality sound. In the world of pick-ups, this near-fully-optioned HSV Colorado SportsCat+ is an extravagance, for sure, and while off-roading is still within the vehicle’s remit, its handling and character lend it a strong road focus. Compared to standard 4×4 pick-ups, for a SportsCat+ with SupaShock suspension you’ll essentially be paying more money for a narrower-focus vehicle. For some buyers, however, the bling and boosted on-road handling, plus the exclusivity of the HSV badge, could well deliver the ‘super ute’ they’ve been waiting for – and they won’t be disappointed. How much does the 2018 HSV Colorado SportsCat+ cost?